It’s really pretty cool. You can make your own soda. You can buy lots of popular flavors, like coca cola, root beer, fanta, etc. Basically you carbonate some water, preferably distilled or well filtered water, and then mix in the flavor syrup and presto! Soda. So I was sitting here drinking some iced tea and I thought… hm… I wonder what carbonated tea tastes like? Well, take my word for it. Don’t try this at home. I just poured some iced tea into the bottle and then carbonated it. All carbonating takes is shooting high pressure CO2 into the liquid. You push the button three or four times and it saturates the water with dissolved CO2. What surprised me is how easy it is to carbonate water. But carbonating TEA is something else again. Because after carbonating the tea, when I went to unscrew the tea from the carbonating machine, I suddenly realized that tea must create some sort of bubble creating solution, which as soon as the pressure is released, well…. sort of EXPLODES! Yeah, explodes. Like all over my kitchen. I’m frickin’ soaked in tea. It was like a tea bomb went off. So, as they say on TV, don’t try this at home. Trust me. 8 users commented in " Carbonating tea "
I think this is due to the fact that where soda tends to be only a pure solution (ie, sugar, flavor etc. is fully dissolved in the water), tea has some aspects more akin to a suspension (particles floating throughout the water, but not dissolved in the true sense). The particles provide many nucleation sites, allowing the gas to form bubbles rapidly (see the mentos and diet coke experiments). At least, that’s my half-cocked hypothesis. Also, I bet your blog went up in all the search engines when I used the phrases mentos and diet coke, and half-cocked. Yeah, I think you’re right. In fact I actually was a little worried about that when my brilliant scheme first popped into my head. I worried that the particulate material would increase the chance for nucleation. But I figured it might just squirt a bit. I didn’t realize it would totally explode like a friggin tea bomb. Wow. I don’t care about your mess. I want to know how it tastes. LOL! Heh, honestly there wasn’t enough left to taste it. The entire bottle foamed up and spurted out. It actually shot out of my hand. By the time we picked it up, it was empty and the carbonated tea was all over the kitchen. We do have some “peach tea” syrup made for the Sodastream. I carbonated some water and put the peach tea syrup in it, mixed it up and it tastes like peach tea. The carbonation makes it taste sharper, like it’s got a bit of “bite” to it. Oh man, a true tragedy that you didn’t get it on video! Doesn’t that thing have a remarkable resemblance to R2D2? Actually, now that you mention it, it does seem to. Does it use CO2 cartridges? What is the CO2 source? 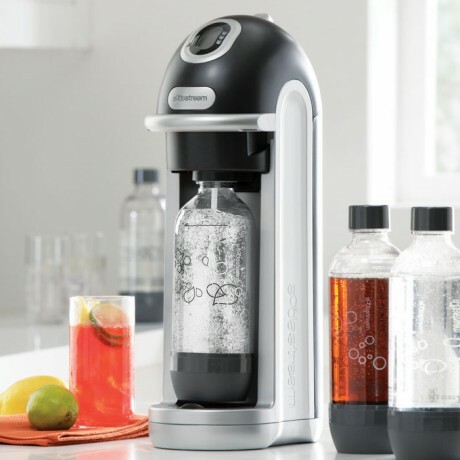 It has a proprietary CO2 cartridge that you have to purchase from a store that sells Sodastream supplies. We get them from Walmart. Well, “them” so far has been one refill, but we’re pretty close to needing another. They are expensive but you can turn in an empty one to get the price down to like $20.